W. S. Graham isn’t the best-known of the 20th-century British poets. His work appears in anthologies, but survey classes don’t always make time for that tiny selection. A reasonably well-read person might still not know his work. The new edition of his poetry published by the New York Review of Books may remedy that oversight. Look into the book instead of over it. Begin with editor Michael Hofmann’s ecstatic introduction. Far from dry and scholarly, this is a kind of extended prose poem of adoration from one poet to another. Love pervades the presentation to point of grammatical frailty: “The Scottish poet W. S. Graham—Sydney Graham, but also ‘Troubleyouas Greyhim,’ ‘Double Yes Gee,’ and ‘Sadknee Graham’ (he had a patella removed when he fell twenty feet onto concrete, but strangely the drunken accident only happened after the sobriquet) . . . —was born a hundred years ago.” It’s an introduction that appreciates the poet in all his living glory, though he died in 1986. Graham’s writing is not the verse of a dead white man (except that it is, but we forgive him). It will get up and dance, given the slightest freedom. Graham’s poetry builds a bridge from the early 20th century to the late, and links the British poets with the Celtic ones. Though he spent most of his career in England, he identified as Scottish, and his writing has Gaelic kinship with both W. B. Yeats and Seamus Heaney. The former shares a late-Romantic passion; the latter relates an enviable linguistic subtlety. The dedication to Nessie Dunsmuir is crucial. The entire volume might be devoted to her, as Graham himself was. They were married in 1954 and lived together (and almost entirely without others) on the Cornish coast. Dunsmuir was herself a poet, though not a prolific one. She composed ten poems in her career, but considered them utterly satisfying. She was also a crucial element of her husband’s creative process. He insisted, “Nessie is necessary.” It was a strong statement for a poet for whom little was necessary: the Grahams didn’t install an indoor toilet until a literary prize financed one in 1970s. What is present is necessary, and nothing is missing. Here is that sonic density that the best poets of the century hurtled toward. Free verse would never do for him. Graham’s poems are dense with meter and immersed in sound. They are living things that only surrender their technical cleverness to the human voice. To love them, read them aloud. 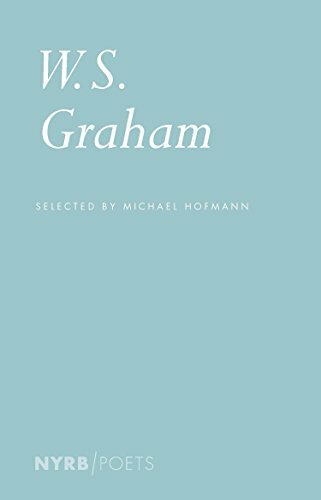 Hofmann insists on the value of Graham’s later poems. And although the early poems are lovely, the later ones have a strength that draws the eye: “O tarnished ticking time / Piece with your bent hand, / You must be used to being / Looked at suddenly.” This stylistic tightness is seductive. Ultimately, this is a book necessary to any reader deeply interested in language and poetics. Read the poems in any order. Read them aloud, to yourself, in a ticking room. Know Graham’s poetry, for it picks itself and lives at the touch of the eye and the voice. All the crucial pieces are here, breathing, waiting for attention.